This advice could apply to any kind of art making, I think. Do what you need. My poet friend went on to say– semi jokingly and semi seriously– that he’s proudly from the “School of Discombobulated Poetics,” a membership that presumably gives him a bit of *ahem* poetic license to mix and match whatever material is around him to create an idea he can call his own. As a practicing junior member of this School, I’m going to go ahead and borrow my poet friend’s idea as the genesis for this blog post. I started out by thinking about basic shot sequences in movies– wide, medium, and close-up. I could never make a movie as grand as Malick, especially considering the equipment it would take to make his signature panoramic wide shots and the gorgeous orchestral music he has composed by professional musicians, to stitch together unrelated images and scenes across time. But I knew that I am a pretty good shooter, due to my experience with photography, so I wanted to practice basics– wide, medium, and close-up. I would stitch the footage together later with some kind of voiceover, maybe some lines from a Masumoto essay, or maybe an original poem I would write. After spending a morning in early June on the farm, starting at daybreak, I had a little more than an hour’s worth of footage to work with. I spent a lot of time mentally drafting a possible order, sketching a few visual ideas in a notebook, and then finally sitting down to give the shoot a serious edit and put together some kind of visual order. My first cut was nearly 12 minutes long, my rough cut was just over 7 minutes long, and the final version came in at 4:23. I put my faith in the visuals, much as Malick does, to generate some kind of “story” that was outside of a narrative with a beginning, middle, and end. I’m pleased with the result, a snapshot of a morning on the Masumoto farm. This brings me back to my poet friend, and to Hayes and to Lorca. Watching my 7 minute rough cut several times, I sketched out key words and phrases and ideas that came to mind. I didn’t want the words to necessarily be synced to the visuals or an “explainer” of the visuals like traditional narration, but I wanted to feel the words were doing their own work, with the visuals side by side. Perhaps the primary “character” I discovered in the rough cut was the wind. The sound of the wind was always present in every piece, often challenging me to deal with its power and unpredictability in the audio editing. I remembered an article I read once about an experimental sound artist and NPR field producer who “interviewed” the wind for a longform feature story. I thought: What if the ingredient I am looking for to stitch these visuals together is actually in a sound? This idea felt right. This is the moment I did something very 21st century: I googled “famous poems about wind.” One of the first was “Wind in a Box” by Terrance Hayes, a striking and elegant poem he wrote after Lorca. Which led me, of course, to google “Lorca poems about wind,” leading me to the beautiful, forlorn translation of his “Romance sonambulo.” I heard my poet friend in my ear at this point: Take what you need. From there, I tried to use my own key words and phrases about the wind with the cadence and line breaks of Hayes, to generate my own poem. Here’s that poem in text form, which I find interesting to look at in comparison to how it works inside the short film. past the sunflowers, past the unblinking horizon. neatly folded around each glowing piece of fruit. past the hills the ants made, toward your harvest. in the middle of the avenue and we will listen to the wind. after the fruit falls, I want to leave it for the earth. sparkling, electrified, holy, pumping straight to its sump. in the packing shed, which lives at the farm’s heart. to mash them. I want to blow them a final kiss. to fight its way into each poem, each photograph, each song. 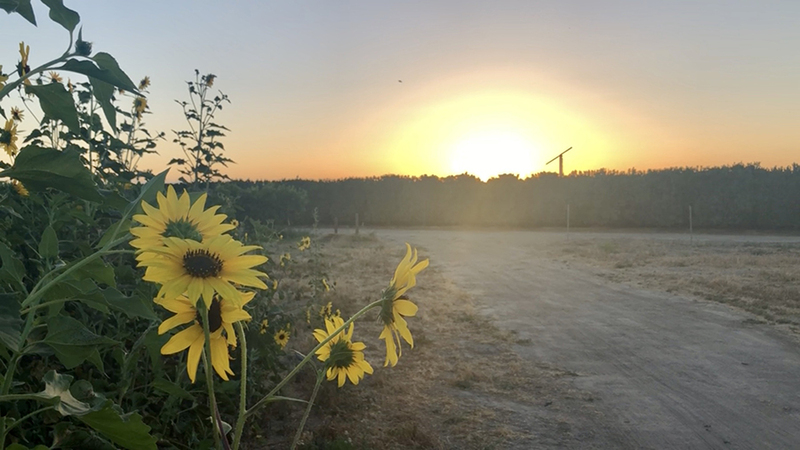 How joyous it felt to take what I needed– from Malick, from Hayes, from Lorca, from the Masumoto family farm, from my poet friend, from myself– to make this short film, my own little wind song for summer. This entry was posted in Multimedia, Poems, Words. Bookmark the permalink.